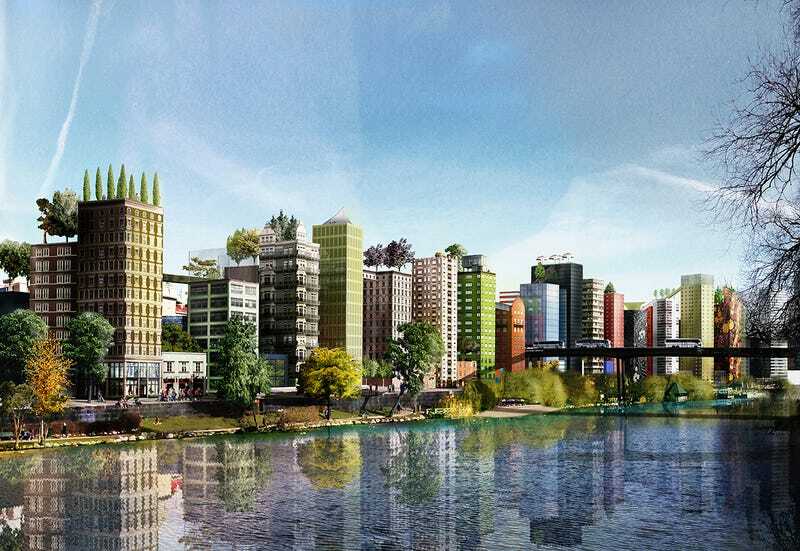 We know that cities will need to get taller and denser in the next few decades. Yet it’s not easy to convince residents to build skyscrapers. 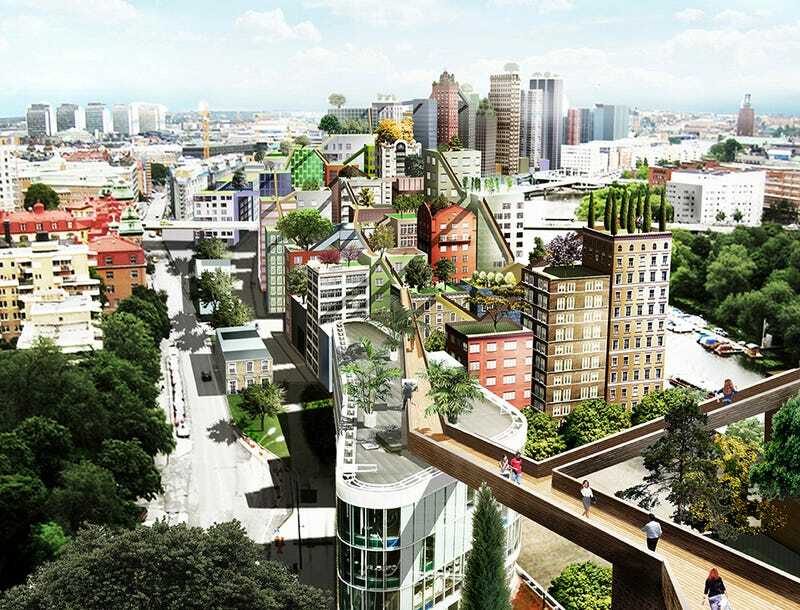 This Swedish proposal for Stockholm’s downtown incorporates light, greenery, and public space into its tall buildings. It makes density look beautiful. 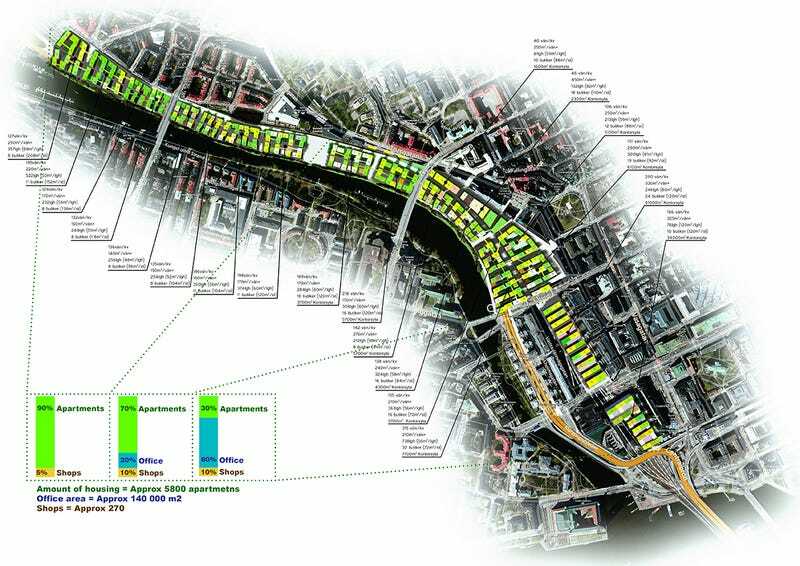 The plan named Klarastaden, “clear city” in Swedish, would revitalize the city’s waterfront by building dozens of buildings atop existing railway tracks. But the key to this attractive plan by Anders Berensson Architects is that as much attention is paid to the top floors of the buildings as the ground-level real estate. 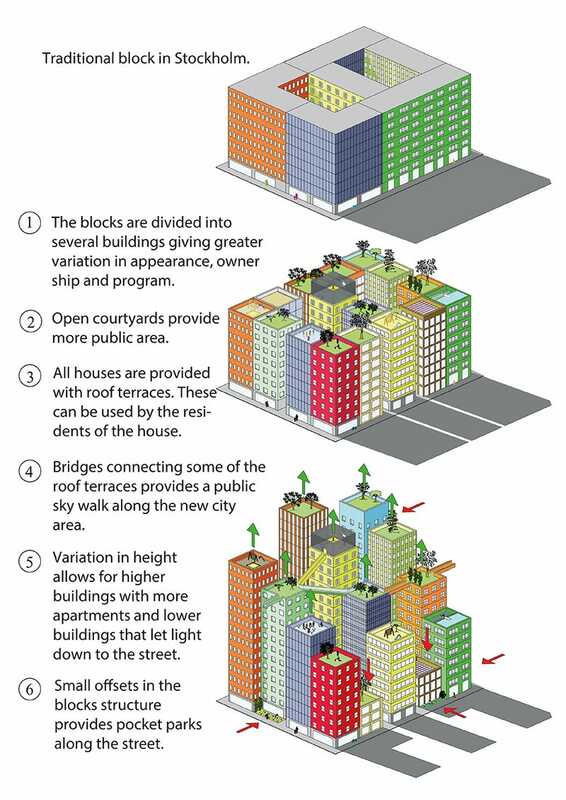 So not only are there plenty of rooftop gardens and terraces, there are also pedestrian connections from building to building via a series of sky walks. There are actually three different “zones” offered by the plan, which grow increasingly more residential as you move away from the central business district. And since the entire neighbourhood is adjacent to Stockholm Central Station, there are direct transit connections via sky ways. Imagine travelling from your 15-story apartment to your train without ever stepping foot on the street. About 90% of all apartments will receive a lake view and the sun will shine through the lower parts of the blocks to reach down to street level during the afternoon. The new city area will host about approximately 5800 apartments, 8000 work places and about 300 shops. That’s a fantastically impressive amount of housing units! The architects break down the benefits even further with this cute illustration that shows how shadows—which are the kiss of death for most tall developments—would be mitigated by the variable heights and use of transparent materials. Sky ways and rooftop gardens are certainly not a radical invention but I haven’t seen them so well-coordinated in a way that creates true public space 10 stories above the streets. Most urban gardens and passageways between skyscrapers are private, and don’t actually beckon the average citizen to explore. This is creating what’s essentially an elevated greenway that offers another way to experience and travel through the city. And those rooftops can offer some pretty substantial parks if ground-level real estate is in short supply. Of course, most cities already don’t have enough space to build dozens of networked towers from the ground up like this. But I think these architects are onto something when it comes to convincing Stockholm that adding more housing doesn’t mean a life of shadows and supertalls. I don’t know about you, but this certainly looks like somewhere I’d want to live.